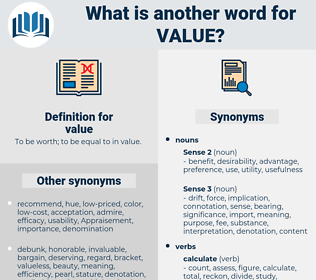 What is another word for value? To be worth; to be equal to in value. puts in a good word. requirements, privileges, strengths, entitlements, Securities, pairs, Ladies, bucks, pros, assess, valeur, amount, amounts. data, NS, desirability, worthiness, devaluation, assess, Valorization, quotidienne, currency, valeur, equivalent, virtue, wealth, capitalization, threshold, depreciation, strength, Advisability, dignity, revaluation, helpfulness, relevancy, indicator, soundness, capitalisation, maximization, tune, valid, meaningfulness, concentration. appreciated, Amounted, Provided, used, Assessed. appreciate, Estimating, Assessed, assesses, valorise, assess, appraise. turnover, high-value, usefulness, worth, amount. dislike, unimportance, insignificance, inferiority, weakness, loss, start, commencement, beginning, hate. drawback, emptiness, negative, failing, blemish, demerit, cheapness, unacceptability, Disvalue, minus, inadequacy, poorness, fault, paltriness, insufficiency, worthlessness, meanness, valuelessness, deficiency, defect, baseness, lousiness, crumminess, inadequateness, flaw. He thought the books of great value and so brought them here. It has no food value. nominal value, price, book value, preciousness, darkness, pricelessness, standard, monetary value, face value, monetary standard, cost, gnp, invaluableness, importance, national income, market price, toll, gross national product, lightness, gdp, par value, market value, unimportance, valuableness, richness, gross domestic product. parameter, characteristic root of a square matrix, argument, eigenvalue of a square matrix, eigenvalue of a matrix, principle, scale value, eigenvalue, introject. overestimate, underestimate, overvalue, undervalue, float.